Dr. Ralf Jauch studied Biology, Psychology and Archeology in Jena (Germany) and Manchester (UK) before doing his PhD in a molecular biology program from 2001-2005 at the Max-Planck-Institut für biophyskalische Chemie in Göttingen, Germany. In 2006 he got attracted to Singapore to join the recently established Genome Institute of Singapore (GIS, part of the A*STAR family) for postdoctoral training. From 2008-2013 he continued at the GIS as a research scientist and drove an interdisciplinary program at the interface of structural biochemistry, genomics and stem cell biology. In 2013 he joined the GIBH as principle investigator and carries out translation research within the DDP as well as academic projects within the stem cell institute. Our interest is to decipher the ‘enhancer code’, that is we wish to understand how regulatory information is genetically hard-wired in the genome. The ‘enhancer code’ determines when and where genes are expressed in our bodies and hence underlies the development of individuals, of species during evolution as well as of tumors when cancers arise. This code is ‘read’ by transcription factor proteins (TFs) that collaborate to trigger cell fate decisions. We use a combination of genomics (bioinformatics and next generation sequencing), structural biochemistry and stem stem cell biology. Goal of our work is to gain fundamental insights into genome regulation and protein-DNA recognition. 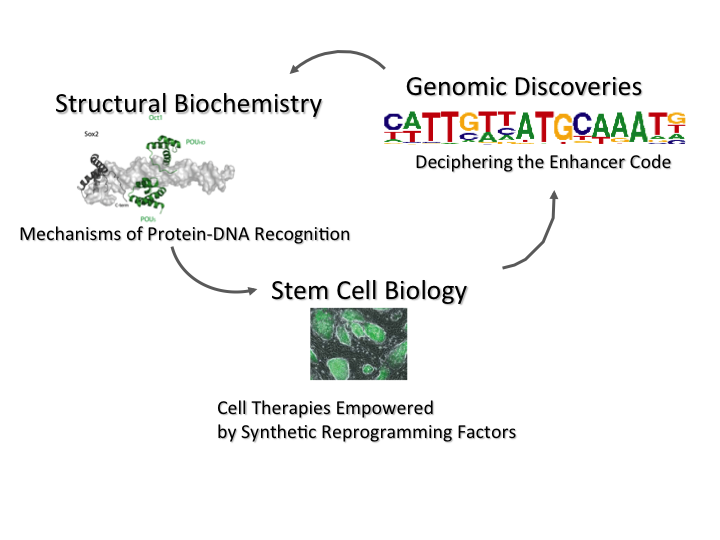 We hope to translate these insights to generate synthetic factors to optimize cellular reprogramming to obtain cells suitable for replacement therapies. We also attempt to develop small-molecule as well as nucleic acid based drugs that target TFs and other genome regulators. Interested individuals are invited to submit their resumes to join our team for studentships, research associate and postdoctoral positions. Esch, D., Vahokoski J., Goves, M.R., Pogenberg, V., Cojocaru V., Bruch, H., Han, D., Drexler, H.C.A., Arauzo-Bravo, M.J., Ng, C.K.L., Jauch, R., Wilmanns, M., Schöler,H.R. (2013) A unique Oct4 interface is crucial for reprogramming to pluripotency. Nature Cell Biol, 2013 Feb 3;15(3):295-301. Hutchins, A.P., Choo, S.H., Misri, T., Woon, C., Jauch, R. and Robson, P. (2012) Co-motif discovery identifies an Esrrb-Sox2-DNA ternary complex as a mediator of transcriptional differences between mouse embryonic and epiblast stem cells. Stem Cells, Feb;31(2):269-81. Johnson, R., Richter, N., Jauch, R., Gaughwin, P.M., Zuccato, C., Cattaneo, E., and Stanton, L.W. (2010). The Human Accelerated Region 1 noncoding RNA is repressed by REST in Huntington's disease. Physiol Genomics. Johnson, R., Samuel, J., Ng, C.K., Jauch, R., Stanton, L.W., and Wood, I.C. (2009). Evolution of the vertebrate gene regulatory network controlled by the transcriptional repressor REST. Mol Biol Evol 26, 1491-1507. Baburajendran, N., Palasingam, P., Ng, C.K., Jauch, R. and Kolatkar, P.R. (2009) Crystal optimization and preliminary diffraction data analysis of the Smad1 MH1 domain bound to a palindromic SBE DNA element. Acta Crystallogr Sect F Struct Biol Cryst Commun, 65, 1105-1109. Ng, C.K., Palasingam, P., Venkatachalam, R., Baburajendran, N., Cheng, J., Jauch, R. and Kolatkar, P.R. (2008) Purification, crystallization and preliminary X-ray diffraction analysis of the HMG domain of Sox17 in complex with DNA. Acta Crystallogr Sect F Struct Biol Cryst Commun, 64, 1184-1187. Jauch R, Ng CKL, Saikatendu KS, Stevens RC, Kolatkar PR. Crystal Structure and DNA Binding of the Homeodomain of the Stem Cell Transcription Factor Nanog. J Mol Biol. 2008; 376(3): 758-70. Jauch, R., Cho, MK, Jakel, S, Netter, C, Schreiter, K, Aicher, B, Zweckstetter, M, Jackle, H and Wahl, MC. Mitogen-activated Protein Kinases Interacting Kinases are Autoinhibited by a Reprogrammed Activation Segment. Embo J. 2006; 25, 4020-4032. Jauch R, Jäkel S, Netter C, Schreiter K, Aicher B, Jäckle H and Wahl MC. Structures of Mnk-2 Reveal an Inhibitory Conformation and a Zinc-Binding Site. Structure. 2005;(13): 1559-1568. Jauch R, Bourenkov GP, Chung HR, Urlaub H, Reidt U, Jackle H, Wahl MC. The Zinc Finger-Associated Domain of the Drosophila Transcription Factor grauzone is a Novel Zinc-Coordinating Protein-Protein Interaction Module. Structure. 2003;(11):1393-402.